At 07:29 on Monday 20 March, the Sun reaches tropical ZERO ARIES, also known as the Aries Ingress. In Halifax, the Sun appears in the twelfth house of secrets and deception. It is also the house of the values of the government (second from the eleventh). The last solar eclipse landed at 8 Pisces, also in this area of life and Neptune is at 12 Pisces now, indicating a high risk of misplaced idealism. Venus, one of two planets offering indications of finances, is deeply unhappy in her detriment by sign and house as well as exactly 30 degrees from the eclipse point. We are to suffer a bit of a shock this year, in terms of our values clashing with those of the ruling party. The other money planet, Mercury is close by – looking as though all the eggs are being (unwisely) placed in a single basket. 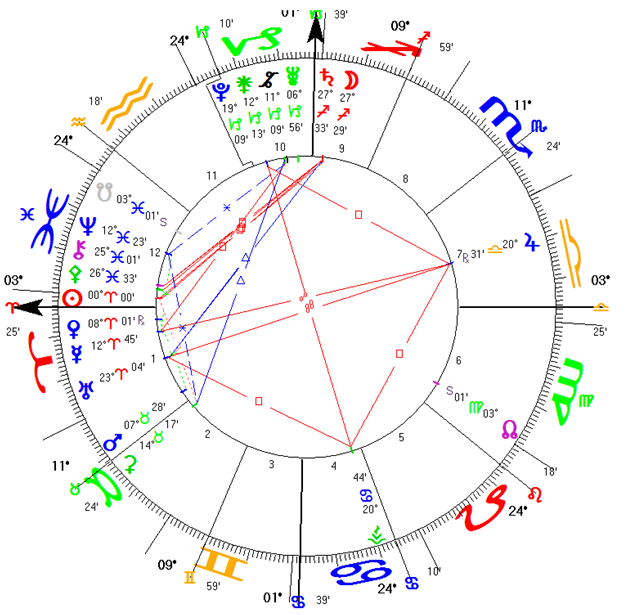 The Moon (public focus and opinion) is in the ninth house of higher philosophy and justice and conjoined by Saturn, which places a sort of mental straightjacket on the building unrest and anger at poor value judgments by elected representatives. The Moon rules the fourth house which is weather, among other things, so we may well be in for a warmer, wetter and ( because the Moon is up in Sagittarius) windier spring than we expect. With Vesta in play, we have a Grand Cross with some heavy outer giants. Anyone with planets or angles at 20 degrees of a cardinal sign ( Aries, Libra, Capricorn, or Cancer) will find big changes coming and not as they hoped or feared. For the Maritimes, the areas affected will be: The People, the Government, the Opposition to the Government and anger over international treaties and disputes. With Pluto in the Tenth, the ruling classes may be surprised to find that the power upon which they have come to rely may not be there when they go to reach for it. The main theme this year is a stripping away of old deceptions and the related loss of power which is its natural accompaniment. The challenge is for the will of the people to remain steady and calm, when the indications are more pointing toward some form of eruption. Thank goodness we are sensible Maritimers!